October isn’t just about falling leaves, candy corn and jack-o-lanterns. It’s also Health Literacy Month, Organize Your Medical Information Month and Talk About Your Medicines Month. Are all of these observances trying to tell us something? Numerous studies have shown that people who are engaged in their health have better health outcomes. That’s why October is a good time to resolve to be informed, get organized and start a conversation. Following are tips to help older adults – and their family caregivers – take control of their health during October, and every month throughout the year. In days gone by, people were predisposed to simply following doctor’s orders, without asking questions or seeking to understand their roles in their own health. Today, with access to better information and more collaborative medical professionals, we can all be more involved in the process. One way to take control of your health is to discuss your medications. That involvement relies on better understanding of diagnoses, prevention and treatment. But according to the U.S. Department of Health and Human Services, nearly 9 out of 10 adults may lack the skills needed to manage their health and prevent disease. Health literacy is “the degree to which individuals are able to obtain, process and understand basic health information and services needed to make appropriate health decisions.” Adults with low health literacy tend to have higher rates of hospitalization, less frequent use of preventive services and, ultimately, higher healthcare costs. Ask questions. Don’t be afraid to ask your doctor for clarification. And keep asking until you understand. Attend a class. Many healthcare organizations provide classes about health conditions. Ask your doctor for a schedule. Make sure you understand any action you need to take. Consider repeating instructions back to your provider to confirm you’re on the same page. Take advantage of health educators or patient navigators. Many hospitals and physician practices now offer professionals to help you navigate diagnosis and treatment. Plan for your doctor’s visits. Consider keeping a notebook to document questions and record what you learn during your appointments. Team up. Another set of ears can help enhance health literacy. If you’re a family caregiver, consider accompanying your loved one to appointments to ask questions and serve as an advocate. Seek out user-friendly information. There’s no shortage of online information to help manage your health. But not all sites were designed to improve health literacy. You can find reliable, current, easy-to-understand information at www.healthfinder.gov. If you had a medical emergency, would your loved ones know where to find your medical information? Would responders know who to contact? Would a doctor treating you have access to your medical history or information about current health conditions and medication? Document important health information. Make lists of current physicians, medications, immunizations and insurance policies. Assemble your family history. Be sure to document diagnoses, hospitalizations and other important health details. Create a healthcare binder. Use it to organize and keep track of health and insurance information, all in one place. Identify an emergency contact. List this individual on all medical and legal documents. And consider storing their contact information on your mobile device. Make it legal. If you ever become unable to make your own healthcare decisions, two legal documents can help ensure your wishes are followed: a Living Will and Health Care Power of Attorney. Designate a place in your home for storing your healthcare binder and all related materials. Share the location with loved ones who may be involved in your care. Create a portable health record. Emergency responders are trained to look for important information about a patient, such as emergency contacts, allergies and health history. The most common places they look? Wallets if you’re not in your home, and the front of refrigerators if you are. Create a card with this information and keep copies accessible. Want to learn more? The Center for Advancing Health provides articles and tips. According to the Centers for Disease Control and Prevention, 700,000 emergency department visits and 120,000 hospitalizations annually are linked to adverse drug events – health situations that are the result of medication. Such events can be more common in older adults, who often take multiple medications to treat chronic illnesses. 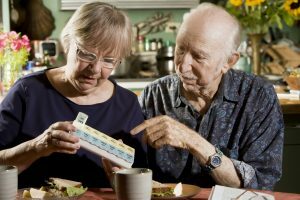 The American Medical Association found that nearly 40 percent of people 65 and older now use five or more medications. Share your medications list. Make sure your loved ones and healthcare providers have a copy of your list. This is especially important when you have multiple providers prescribing medications. Read the label. Be sure you understand the correct dosing and schedule, how to take the medicine, side effects and potential drug interactions, as well as the proper storage of all medications. Use a single pharmacy to fill prescriptions. This can help prevent dangerous drug interactions. And always be sure to check prescriptions before leaving the pharmacy to confirm they’re correct. Ask questions. Make sure you understand what you’re taking, when and how much, as well as the type of side effects you may experience. And ask about warning signs of adverse reaction to medication. You can find more information to help with medication discussions from the National Council on Patient Information and Education. Have more questions about taking control of your health? Our Just Ask FirstLight service can connect you with an expert. And through our Companion Care Services, FirstLight can also help with transportation to doctor’s appointments, organization of health information and reminders to take medications. Find a location to learn more today.